Do you have a little Labrador running around? They are so full of energy, aren’t they? I personally love Labs because I am a proud parent to a three-year-old Labrador! But, you really need to take care of your doggy’s nutritional needs. Especially during puppyhood when your little ball of fur is growing, exploring and learning new things. This is a critical time in your puppy’s life! So, let’s take a look at the best puppy food for labs so that you can ensure that your puppy stays happy and healthy throughout his life. So, today we’re going to talk in detail about these five best dog food for lab puppies. Don’t worry! This isn’t it. I’ll talk about these in great detail, but that I’ll do a little later in the article. So, here’s a quick look! Now, let’s come back to this a little later, shall we? What Should You Even Be Feeding Your Puppy? Did you know that dry kibble isn’t the only kind of dog food? Actually, there are four different kinds of dog foods that you can feed your little pup, but the experts can’t really decide as to which is the best food for these adorable balls of fur. Let’s talk about these four foods, shall we? Kibble is the most popular dog food available and is widely used by thousands of dog owners. This is really convenient if you’re a busy bee. Wet food, I feel, is the second most popular option and it consists of cans and pouches of wet foods that puppies tend to love. Now, I’m sure you already knew about these options. But now, let’s talk about the less conventional options, shall we? BARF actually stands for ‘Biologically Appropriate Raw Food’ in which you basically feed your puppy what his natural diet would have been in the wild. Finally, we have the home-cooked meals for your puppy. They, I feel, are the best. But, for that, you’ll have to cook for the pup and it can get a little hectic. 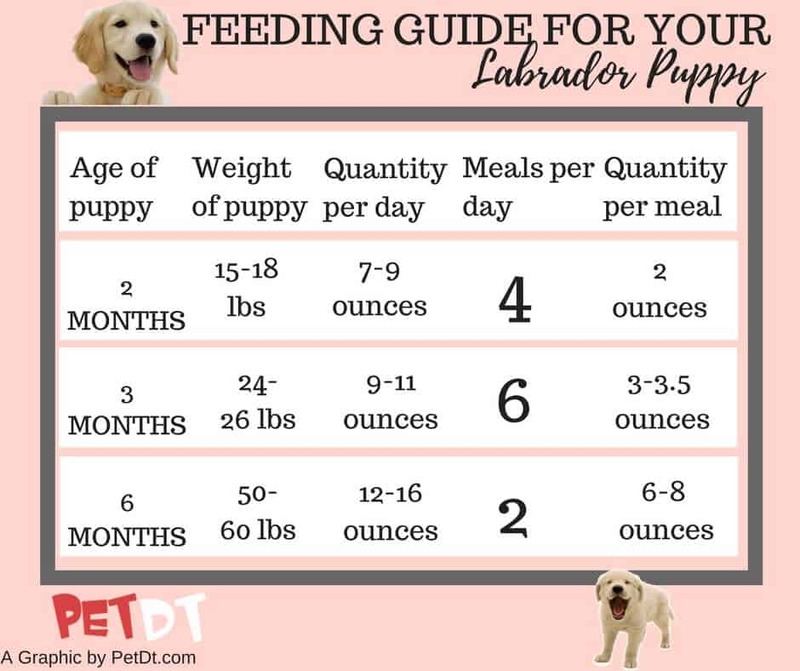 It’s for you to decide the best for yours, but, read on to look at the best dog food for lab puppies! Kibble is the most convenient puppy food that you can find. This comes ready-made in a packet in form of food pellets. They store really well and you don’t really need to worry about them going bad for a long time. Even though there are a lot many options, this is probably the one that’d be recommended by most of the vets and dog owners. Should I be Feeding My Puppy Other Food With Kibble? No, you do not have to feed your puppy anything else in addition to kibble. And, labradors have a tendency to put on a lot of weight. And so, feeding your doggy something a little extra besides kibble will do more harm in the long term! Kibble provides your puppy with a complete and balanced nutrition. So, what you need to do is simply pick a good brand and go with it! Why Kibble Over Other Foods? In the previous section, I told you that there are a few puppy food alternatives available. Now, I’ll talk about the reasons why people like to choose kibble over them all. Let’s go over that, shall we? Another advantage of picking kibble is that it helps keep your doggy’s teeth strong and also has a cleaning effect on them! The owners love the fact that kibble is easier to store as opposed to wet dog food. All you need to do is to put it in an airtight container and you’re good to go! Why Can’t I Feed My Puppy Adult Dog Food? Well, this is something that you must naturally be wondering. And, I’ll address your concern. See, the thing is that puppies need lesser amounts of certain nutrients in this crucial time. And, with Labradors, they tend to be in their puppyhood until the age of 12-18 months! With adult food, there are just way too many carbs and fats. And you know Labradors are infamous for getting really fat really fast. And, that’s not even a good thing! If you were to feed your little puppy some adult food, then, he will gain a few extra pounds. And, by the time he reaches adulthood, he’d be obese and lazy. The adult dog food also contains a lot of calcium, which is a bad thing for your puppy as it increases the risk of your puppy developing skeletal-muscular disorders later in life. And, finally, puppy kibble has smaller food pellets when compared to dog food. This makes it easier for puppies to chew and digest. The bottom line? Stick to puppy food! And not to the best dog food for labs. Cheaper Equals More Costs Later In Life! Whenever you’re buying puppy food, make sure that you don’t buy looking at the price tag. You should be looking at the ingredients, instead! I understand your urge to save money. Don’t we all? But, your food or your doggy’s food isn’t something that you should compromise with. This can cause you to shell out a lot more dollars in the longer run! Well, the cheap dog food contains low-quality ingredients that can harm your doggy’s body if he eats that food for a long period of time. On the other hand, the high and medium-priced dog foods contain good-quality ingredients. So, you know the obvious choice, right? Getting The Macros Just Right For Your Puppy! So, you may already know this, but I’ll still state the obvious. Labradors are large breed dogs. Your puppy grows a hell lot in size during the first six months of his life. And for that to happen, they need just the right amount of nutrition. Let’s look at the macros, shall we? High-quality sources of protein, like meat are vital for your puppy during this stage. In fact, protein helps build half of the dry bone mass! The amino acids that are present in protein also help develop tissue muscle and organ! Did you know that fats provide the greatest proportion of your puppy’s energy? In fact, fats are even more important in your doggy’s diet than carbs or protein! Dogs tend to convert fats into glucose. And, they also help your doggy get stocked up on omega-3 and omega 6! Carbs: The Source of Energy! Carbohydrates and carbs are those ingredients that help keep your doggy ‘full’ and provide him energy. These include starches, fibers, and sugars. Now, these carbs get converted to glucose when they’re digested. This gives your puppy the energy to play all day long! Fibers also help your dog take regular….dumps. We often tend to ignore vitamins and minerals but they’re important as well! The thing is that only a few vitamins and no minerals are made in your tiny doggy’s body. So, you need to feed him the right foods! Did you know that your puppy can make Vitamin D if he got about 15 minutes in the sun thrice a week? So, look for chelated minerals in your doggy’s food. Or, buy some supplements. Labrador’s Nutritional Needs: What To Look Out For! Like all breeds, Labradors are unique and they’ve got different nutritional needs. Let’s take a quick look at those, shall we? According to the Integrative Veterinary Care Journal, protein levels between 23-31% are ideal for labradors. And, fat is another issue. Too much of it can cause problems. So, you should try to stay between 10-25% of fat for your lab puppy. I’ve made a little guide for you so that you know when and how many times you need should feed. Now, let’s finally jump to the best puppy food for labs! The Best Puppy Food For Labs Available Right Now! Even more so if you’re living a hectic life? So, how do you make sure that your adorable little lab puppy gets the best of the best puppy food? Well’ that’s where I come in the picture! Don’t worry, I’ll help you along the way. Shall we get started? I’ve made a table just for you so that you can have a quick glance at it and choose the one you feel is the best for your puppy. But, before you jump the gun and buys dog food, you also need to keep in mind that it’s not only the ingredient and their quality which you should look for. So, what I mean to get to is that you should also keep an eye on the food’s meat content before buying it. After all, we only want the best for your puppy friend! So, let’s talk about all of the foods in detail, shall we? If we look at the ingredients alone, then, Taste of the Wild Grain-Free Dry Dog Food for Puppy is an average dog food for your tiny little puppy. Let’s talk about all the macronutrients and meat content in the food, shall we? Let’s turn the stats into something you can understand! This dog food had an above-average amount of protein which is a good thing. It also has above-average fat, but below-average carbs. This dog food also has a moderate amount of meat content, so your puppy will love it! So, what does this boil down to? 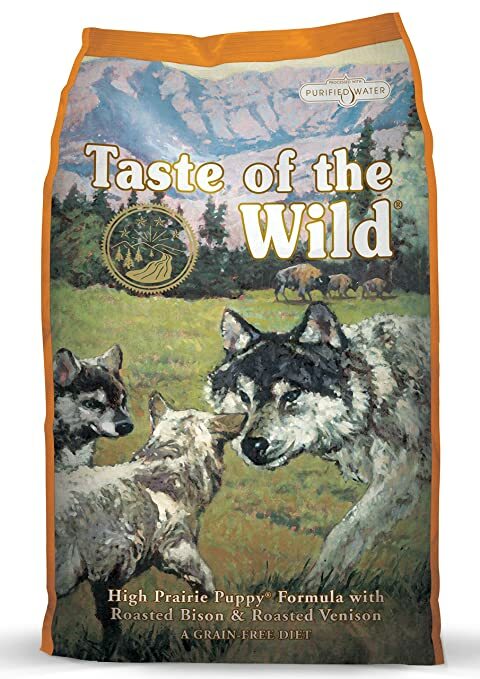 According to me, the Taste of Wild dog food is one of the best puppy food for labs available in the market. It has a good amount of carbs and protein that’ll help keep your puppy happy and healthy! If you’re looking for the best puppy food for labs then you mustn’t ignore the Eukanuba Puppy dry dog food is something that you must look at! Let’s know more about this puppy food, shall we? Did this just go over your head? Let’s convert these numbers into something that’s easier for you to understand, shall we? Well, this dog food is an average dry dog food product available in the market. This one has near-average amounts of all the three macronutrients, i.e., carbs, protein, and fat! This is a good product for Labradors who tend to put on weight as they grow older. And you know what that means, right? They get lazy! What’s great about this dog food is that it contains moderate amounts of meat, even if you single out the effects of flax meal and yeast. The EUKANUBA Puppy Dry Dog Food deserves to be on my list of the best puppy food for labs because it has chicken-by-product meal as the main source of protein. 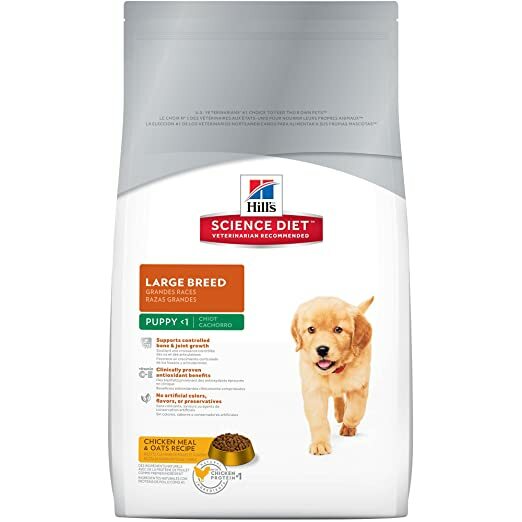 The Hill’s Science Dog Food too is one of the best puppy food for labs available in the market. This one’s an above-average dry product and has good macros. Let’s talk about them in detail, shall we? Thank me in the comments section to explain these to you! So, this dog food contains a below-average amount of protein and fat But, an above-average amount of carbs. So, I feel it’s better suited for puppies that have a lot of energy. Now, let’s talk about the meat, shall we? So, if you single out the protein content in peas, corn, and flaxseed, this dog food still has a modest amount of meat in it. I really do feel that this is one of the best puppy food for labs. 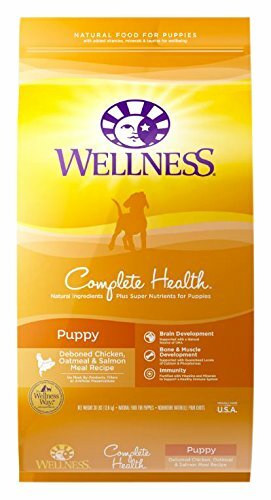 When it comes to judging a food by its ingredients, Wellness Complete Health Natural Dry Puppy food is an above-average dry puppy food and one of the best puppy food for labs. Before we make any judgments, let’s talk about the ingredients, shall we? So? What do these numbers say? Well, these numbers just say that Wellness Complete Health Natural Dry Puppy food contains a near-average amount of protein, fat, and carbs when you compare it to an average dog food. Now, let’s talk about the meat content, shall we? I feel that this is one of the best puppy food for labs which is available on the market. What about you? This one’s the last dog food that I’ll be talking about today. 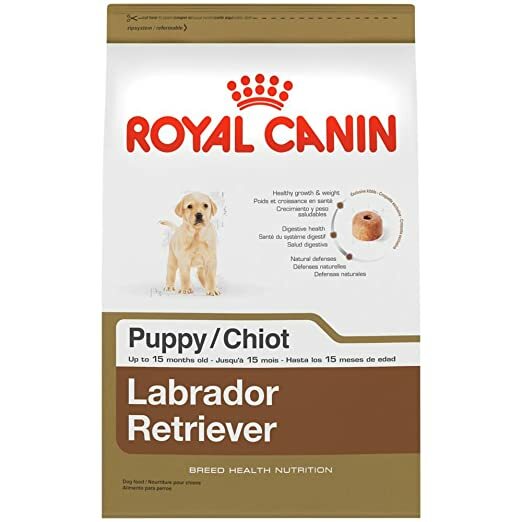 Royal Canin is a very popular brand and this dog food is made especially for Labrador puppies. But, when you judge it by the ingredients alone, this one is a below-average puppy food for labs when compared to other dogs foods. This puppy food contains above-average protein which is a good thing, near-average fat, and below-average carbohydrates. Well, this dog food already has a good amount of protein in it, but when we single out the protein in wheat and corn, this one still has a moderate amount of meat in it. I feel that the Royal Canin Breed Health Nutrition dog food is one of the best puppy food for labs available as it contains chicken by-product meat. Labrador puppies are very active and smart little puppies who love spending their time playing and chewing anything in their sight! So, you need to keep an eye on your little pup’s diet for him to stay happy and healthy! Well, first of all, you need to decide whether you want to feed your doggy kibble or not. Most dog owners feel that kibble is the way to go. Secondly, you need to make sure that your puppy food has just the right amount of nutrients in it. So, you need to buy the best puppy food for labs! And, I’ve got a few recommendations for you! Have something to say? Well, leave a comment below and tell us how you feel! We love reading your comments. And, if you’ve got any burning queries, ask us! We’re always happy to help!